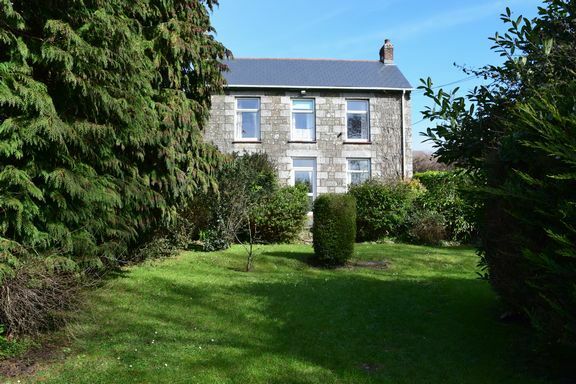 Offered for sale with no onward chain and requiring a course of modernisation, this handsome detached stone built property benefits from a detached garage, parking on the drive, good sized gardens and rural views. Located in a semi rural setting on the outskirts of a village there is excellent access to a wide range of amenities. Internally there are two reception rooms to the front with a single storey extension to the rear which we believe was constructed in the 1960s and which provides a kitchen dining room and a shower room. We are informed that the property has been re-wired and has had a new roof in recent years but would benefit further from renovations. The majority of the windows are double glazed and there is night store heating. Externally the majority of the garden is to the front with walling and Cornish stone hedging enclosing, this garden is laid to lawn with mature trees and shrubs with an outbuilding and access to a good size garage and parking on the drive. Dining room: 4.03m (13'3) x 3.57m (11'9). Double glazed window to front. Fireplace with tiled surround. Night storage heater. Lounge: 4.03m (13'3) 3.57m (11'9). Double glazed window to front. Fireplace. Night storage heater. Kitchen dining room: 6.39m (21') x 2.50m (8'2). (Measured as both rooms together). Kitchen area: 2.71m (8'11) 2.50m (8'2). Fitted with a serviceable range of units but ideally in need of updating, the kitchen is fitted with matching base, wall and drawer cabinets with roll edge work tops. Single drainer sink with tiled splash backs. Plumbing for washing machine. Space for fridge/freezer. Double glazed window to rear, double glazed aluminium door to rear. Dining area: 3.5m (11'6) x 2.50m (8'2). Space for dining table and chairs with additional kitchen cabinets. Double glazed window to rear. Night storage heater. Shower room: 2.55m (8'4) x 1.34m (4'5). Shower enclosure with electric shower and tiled splash backs. Low level W.C. Built in wash basin in vanity cabinet. Double glazed window to rear. Heated towel rail. Built in storage cupboard. Bedroom 1: 4.05m (13'3) x 3.03m (9'11). Master bedroom with double glazed window to front with rural views. Night storage heater. Bedroom 2: 4.02m (13'2) 3.09m (10'2). Second double bedroom with double glazed window to front with rural views. Night storage heater. Bedroom 3: 2.51m (8'3) narrowing to 1.80m (5'11) x 1.96m (6'5). Double glazed window to front with rural views. Outside: Externally the majority of the garden is to the front with walling and Cornish stone hedging enclosing, this garden is laid to lawn with mature trees and shrubs with an outbuilding and access to a good size garage and parking on the drive. The garden to the rear is laid to lawn with a pathway to the side which leads to the front. The gardens are a safe and attractive environment for both children and pets and are a particular feature of the property. Property descriptions and related information displayed on this page, with the exclusion of Running Costs data, are marketing materials provided by Redwood Estate Agents, and do not constitute property particulars. Please contact Redwood Estate Agents for full details and further information. The Running Costs data displayed on this page are provided by PrimeLocation to give an indication of potential running costs based on various data sources. PrimeLocation does not warrant or accept any responsibility for the accuracy or completeness of the property descriptions, related information or Running Costs data provided here.